Today we got a much earlier start. 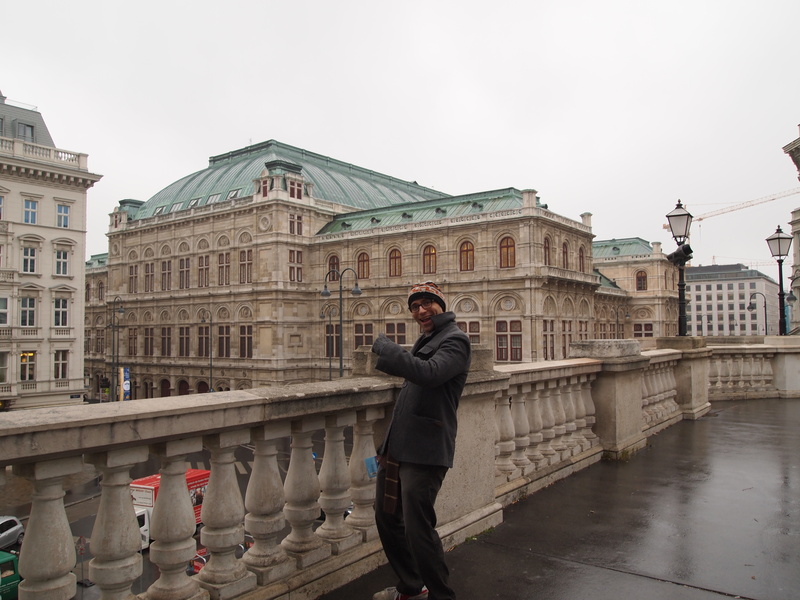 We were out the door, got breakfast, and at Albertina Museum just after it opened. 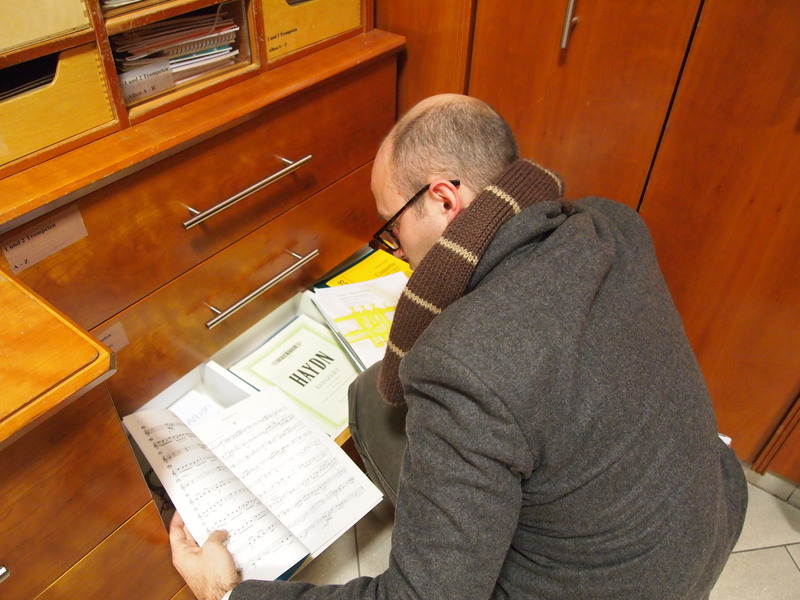 We spent a few hours there. It’s a nice museum with some really great exhibits. 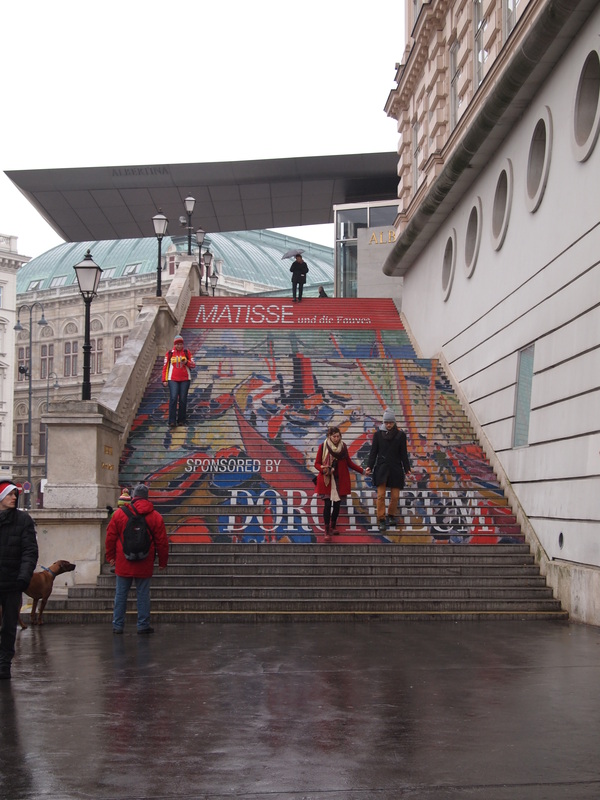 We saw a good mix of Impressionism, Expressionism, Fauvism, even some Pointillism. There was the usual mix of Monet, Matisse, Derain, Gauguin, but I also liked a lot of artists that I don’t know much about – Kandinsky, Jawlensky, Lebasque, Vlaminck, and Van Dongen. It was a really nice, compact museum with a good layout. The only downside was that there were a lot of school groups in the main exhibition and they were a little annoying at times and it could get pretty crowded. 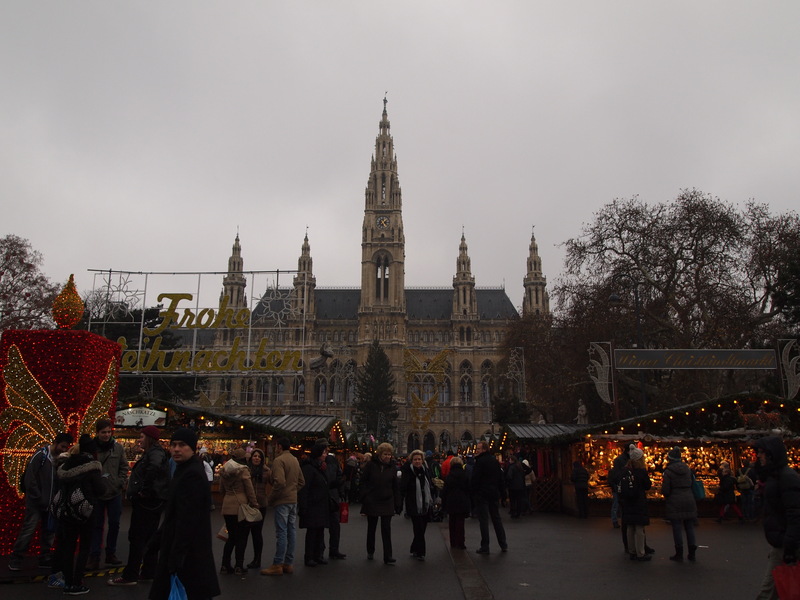 We left Albertina and walked over to a café we had read about, but it looked really crowded since it was around lunch time so instead we walked across the street to the Rathausplatz Christkindlmarkt. I haven’t really gone into much detail about the Christmas markets yet, but all of them are generally the same in principle. There are a bunch of vendor stalls selling ornaments, chocolates, various handmade crafts, a lot of beeswax candles, and ceramics. 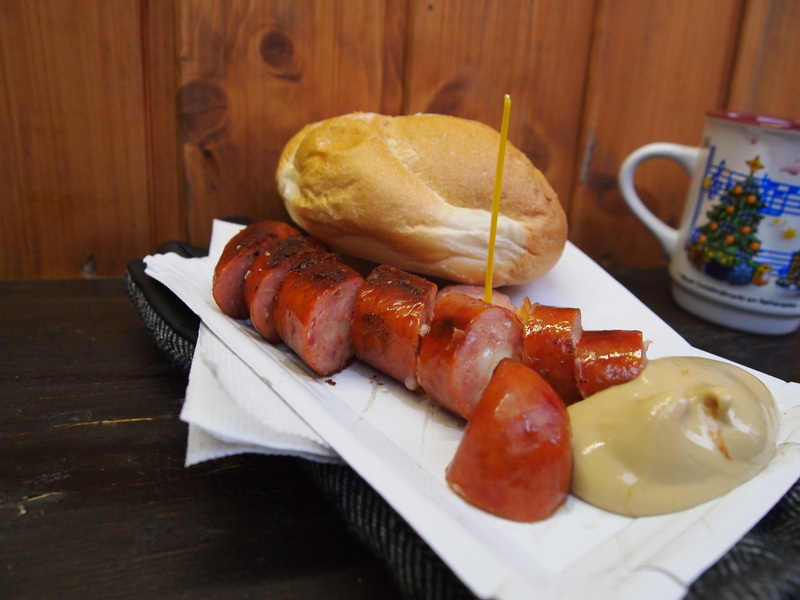 Then there are the food stalls with varying meals – in Budapest we had goulash and sauerkraut stew. THEN there are the most important stalls – the beverages. We’ve been drinking mostly mulled red wine, but we’ve also tried honey wine and white wine. 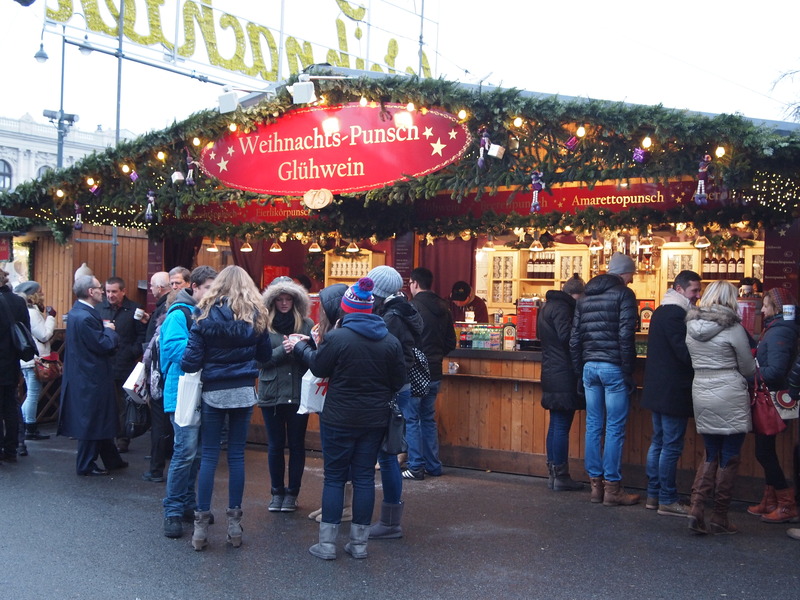 Today we had glühwein (mulled red wine) and we ate a Käsekrainer which is a cheese-infused sausage – yum! 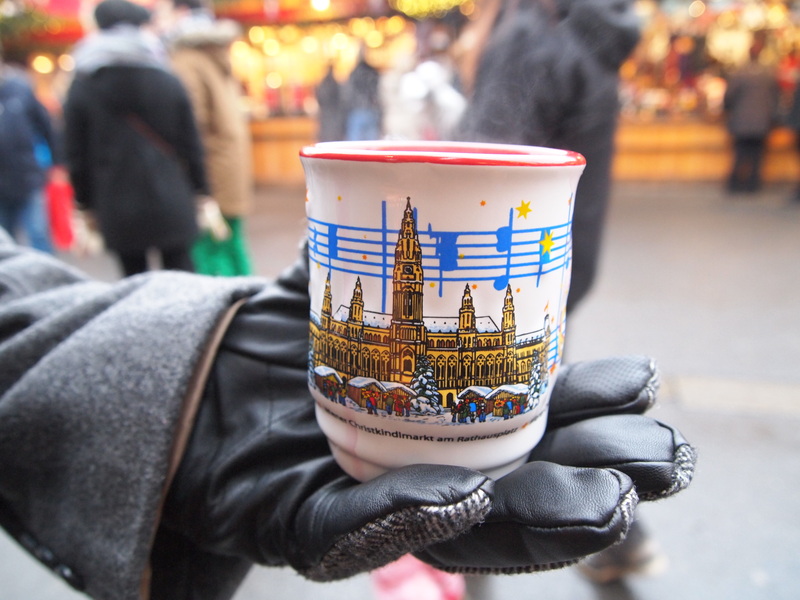 In Vienna you are served mulled wine in a commemorative mug and you pay a deposit. If you return your mug before you leave the market you get your deposit back. 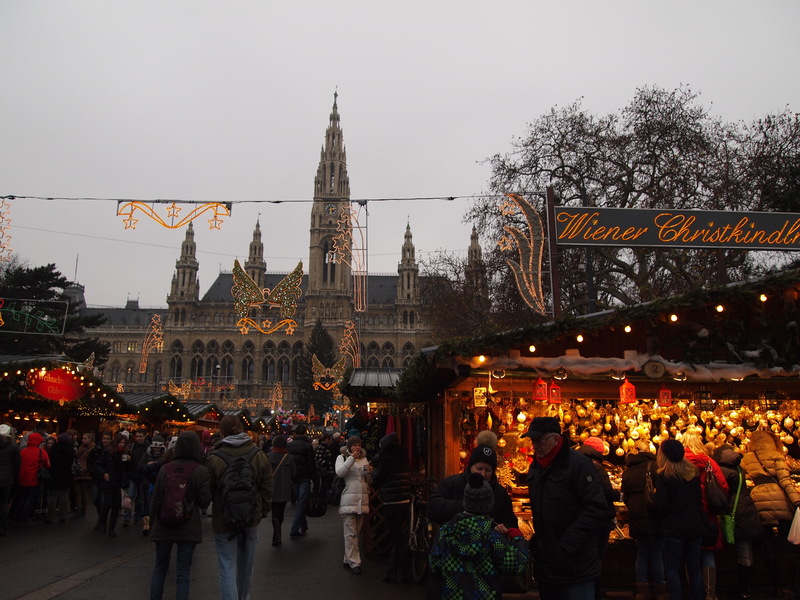 So today was our first experience at a market in Vienna ( I think there are around 13 here) and it was great! 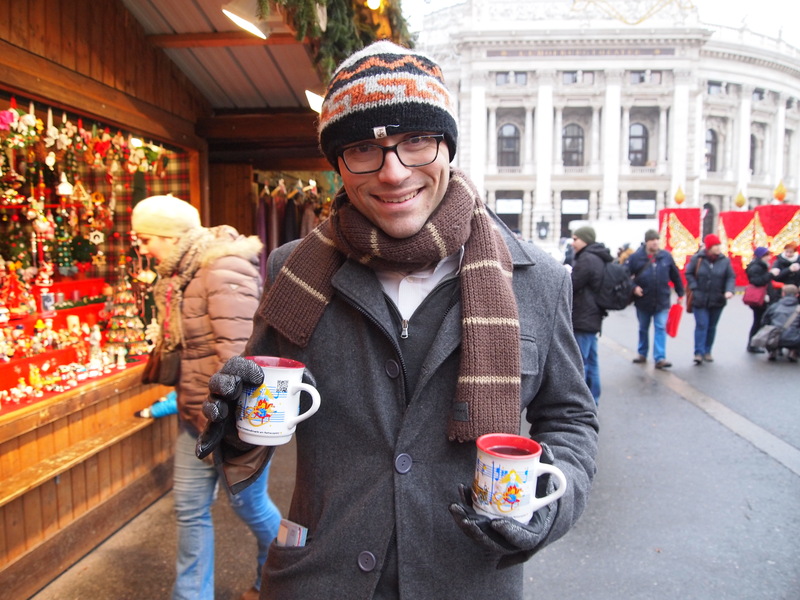 I bought a painted ornament with the Rathaus on it and we walked around keeping warm with a couple mugs of glühwein. 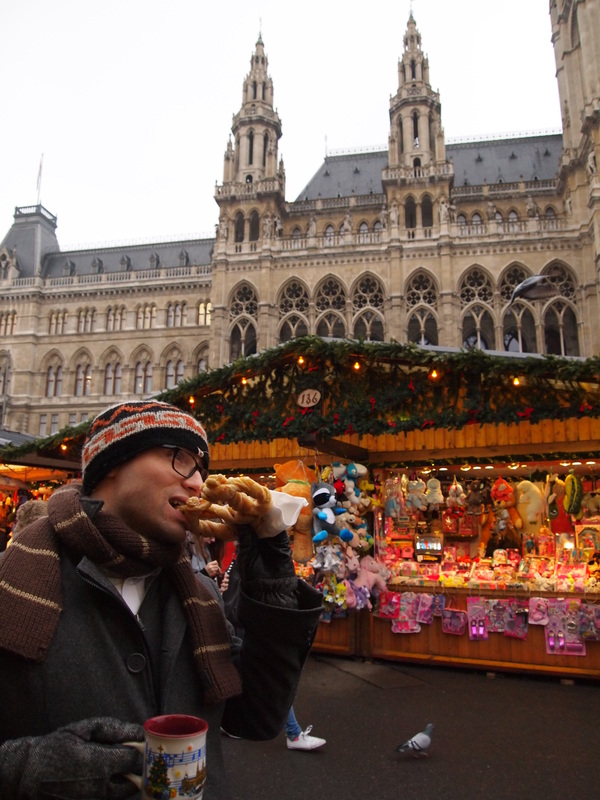 Tomorrow we plan on visiting the market at Schonbrunn Palace. After we were starting to get tired we decided to walk back over and try the café again. This time we were able to secure a seat easily. 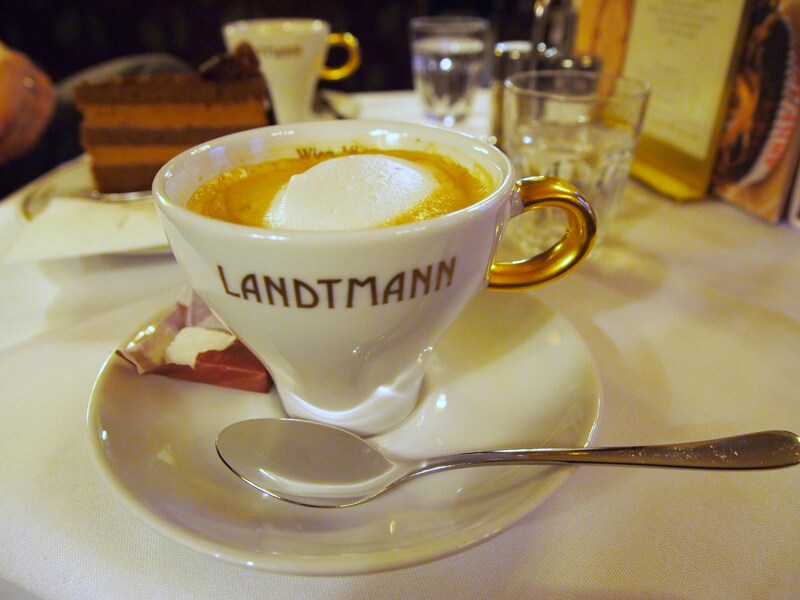 Café Landtmann was one of Freud’s favorites in Vienna. The interior wood walls and comfortable bench seating really allows you to relax and read or write or think. 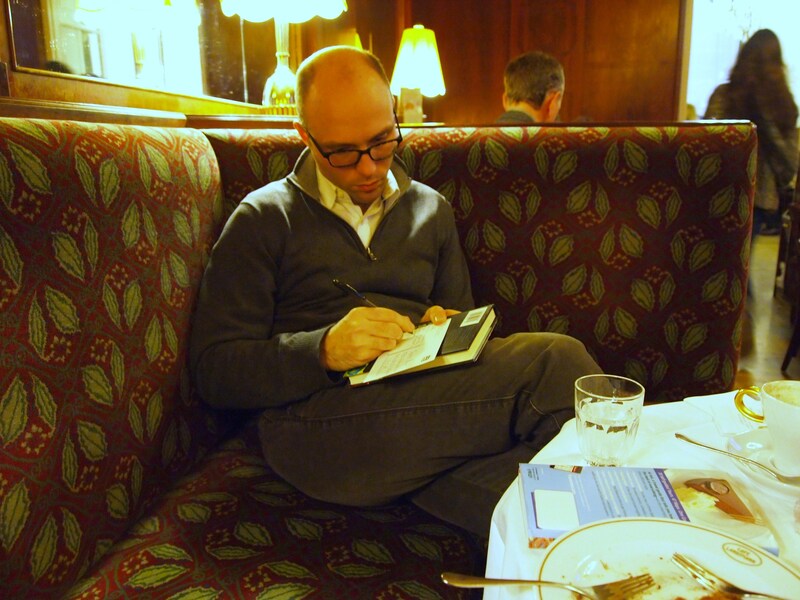 We had some coffee and a cake and wrote up some postcards. 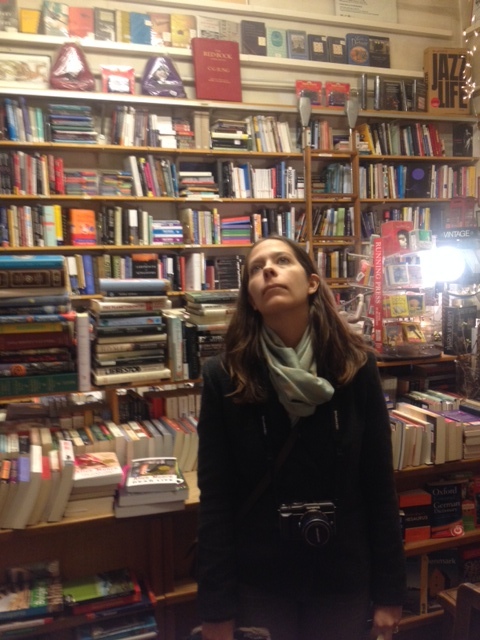 We left Landtmann to do a little shopping at a music store for Zach and a book store (Shakespeare & Co.) for me. 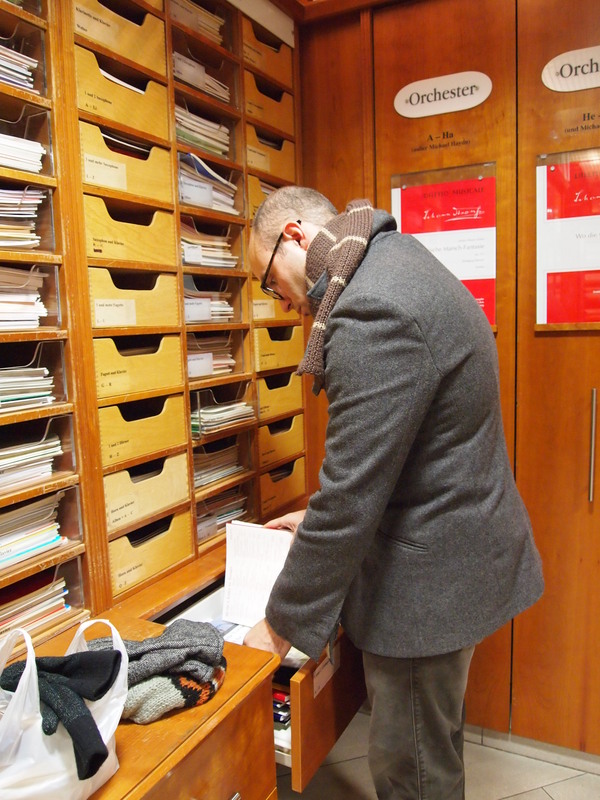 Then we went back to Thomas’s to drop off our things before meeting him for dinner at Pizza Mari – his favorite pizza joint. Pizza Mari was delightful. 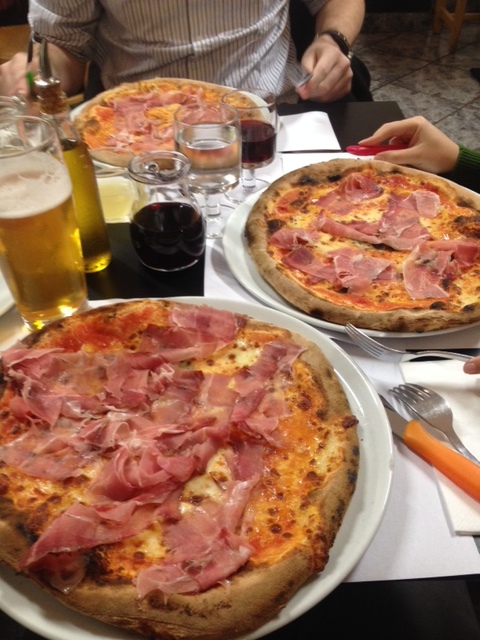 We all had prosciutto pizzas and then followed it up with espresso and chocolate cake. It was a nice, filling dinner. It was already getting late and we had had a full day of walking so we decided to call it a night and just hang out back at Thomas’s and make plans for our final day in Vienna.